Pierre would be?happy that?we did not leave him out. 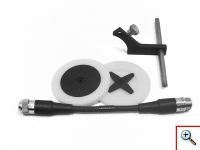 The Thales-Angenieux Kit includes everything you will need. The zoom adapter is a 8 pin connection to control your zoom and start and stop. The Angenieux gears which will attach to our standard servo, no need to buy another one. The Angenieux lens mount is smaller to match the pitch diameter, with a M3 treaded Mounting Knob.